Changing consumption patterns mean that many countries in sub-Saharan Africa, including Nigeria, has increased their wheat importation. But, overreliance on importation carries risks of sudden food insecurity and loss of resilience. Finding ways to boost domestic production is widely acknowledged as a promising solution. Wheat consumption is rising rapidly in sub-Saharan Africa, and importation account for over 70 percent of the region’s needs. Change is needed to protect ordinary Africans from the vagaries of global commodity markets and strengthen the continent’s wheat security. Without change, the continent’s population will remain vulnerable to sudden food price hikes. 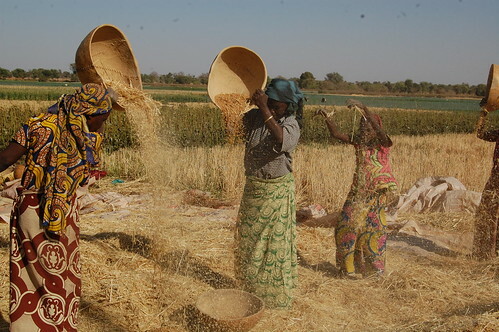 Nigeria, for instance, currently imports four million tons of wheat, spending more than US$4 billion on the commodity every year – a figure that is expected to reach US$10 billion by 2030 when Nigerians are predicted to consume over 10 million tons of imported wheat to satisfy their growing demand for nontraditional foods like pasta, noodles and bread. This ever expanding gap between demand and supply is unsustainable and the primary cause of many societal problems, including widespread hunger and periodic violence. Higher domestic production of wheat is the key to solving Africa’s increasing dependence on wheat importation. To address these challenges, scientists have been working closely with local communities in three districts in the western part of Rajasthan to develop best practices and technologies on water conservation and regeneration of degraded pasturelands. Scientists and communities collaborated to identify both biophysical and institutional opportunities and challenges for reversing degradation and sustainably intensifying agricultural production. Extensive community consultations were organized to improve and advance equitable by-laws and new institutional arrangements. As a result, a village development committee representing all sections of the community was established, and it now manages the shared pasture system. A women sub-committee is responsible for managing the harvest of fodder. Engaging the whole community is believed to be critical to the long-term success of the intervention. Scientists are working to tackle the dependence on importation through an integrated package that reflects their systemic approach to the challenge. Interventions include development of high-yielding, heattolerant wheat; fast-track seed multiplication programs; the dissemination of proven technologies and farming practices, such as raised-bed farming; promotion of a value-chain approach to support domestic producers; and, finally, a recommended package of policy interventions. 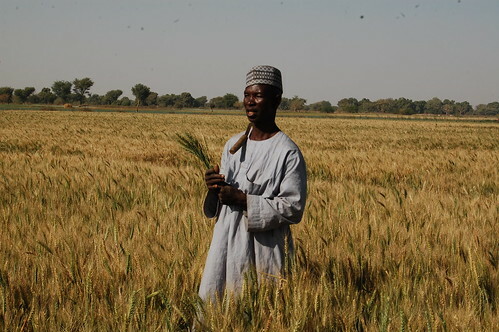 In Nigeria, many traditional wheat varieties grown are prone to pests, have poor baking qualities, and rarely generate yields that exceed two tons per hectare. The memory of previous wheat production drives is also prominent in the minds of many. In the late 1980s and early 1990s, for instance, seeds more suited to temperate climates were introduced in Nigeria and failed in the hot, dry conditions prevalent across the country’s wheat-growing regions. That’s why new, high-yielding, heat-tolerant wheat varieties are now being put at the center of a policy shift to reduce wheat importation and improve food security. 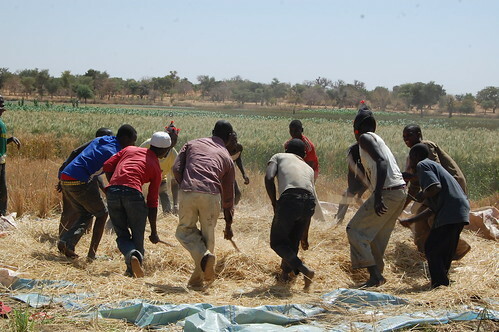 First introduced in Sudan, these varieties are now being adopted in Nigeria, where they are set to cut current wheat annual import costs by 40-45 percent. 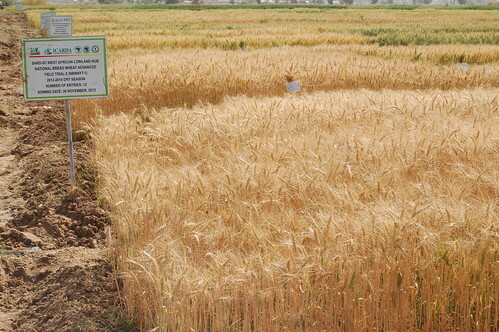 The new and improved wheat varieties, developed over the past three decades, are showing very promising results. Tested on farmer fields in Kano and Borno states, the new varieties yielded five to six tons per hectare, up to three times that of traditional varieties. These results are convincing policymakers that wheat can be grown on a large scale in northern Nigeria and solve the country’s dependence on importation. As a result, wheat has been included as a priority in the Nigerian government’s Agricultural Transformation Agenda (ATA). Because these new wheat varieties meet the required end use quality, the Nigerian Millers Association has officially submitted a written commitment to the Ministry of Agriculture and Rural Development stating that that it will buy all the wheat produced in 2016 under this new initiative. During the 2016 cropping season, the country is expecting to harvest 350,000 tons of wheat from the total 100,000 hectares of wheat areas. The Minister of Agriculture and Rural Development, Honorable Audu Ogbeh, has announced that Nigeria has dedicated 300,000 hectares of land to wheat production in 2017 to significantly reduce the overdependence on importation. To this effect, the ministry and government will continue to support wheat farmers by providing inputs, mechanized operations and access to credit and markets. Today, Nigeria is spending over US$4.6 billion every year on wheat importation and domestic production accounts for less than 7 percent of the country’s annual wheat requirements,” he said, and added that this dependence on wheat importation was “totally unacceptable.” The only way to stop this would be through changing rural economies by transforming agriculture. Scientists expect that the introduction of high-yielding, heat-tolerant wheat varieties at a large scale will increase incomes for farmers, create job opportunities for women and youth, alleviate poverty as well as strengthen Nigeria’s local capacities for processing and marketing. This activity was led by the International Center for Agricultural Research in Dry Areas under the CGIAR Research Program on Dryland Systems and in partnership with Agricultural Research for Development of Strategic Crops in Africa (SARD-SC) and the African Development Bank. This research was supported by CGIAR Fund Donors. Marianne Gadeberg is a freelance writer, editor, and communications specialist. International Center for Agricultural Research in Dryland Areas, Improved wheat varieties: a solution to African import dependence. ICARDA science impact series.